MAPUTO, May 13 (Xinhua) -- Five years have passed since Chinese President Xi Jinping expounded on China's Africa policy in Tanzania, which has drawn a roadmap for the future of China-Africa ties in the new era resulting in closer China-Africa traditional friendship, cooperation, as well as stronger political mutual trust. 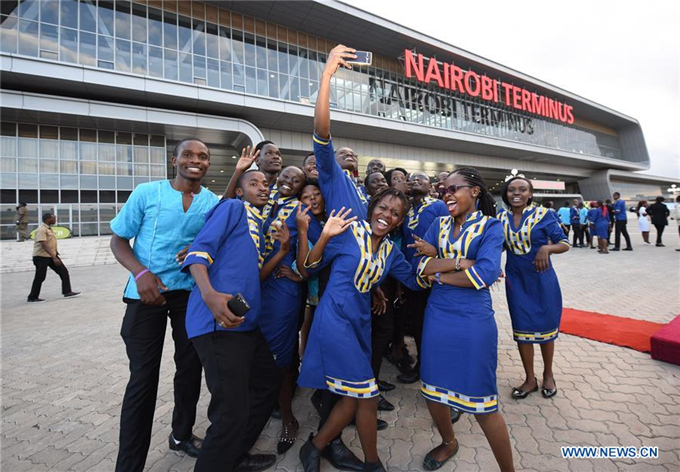 The policy, which adheres to the principles of sincerity, concrete results, affinity and good faith, was announced by Xi during his first visit to Africa since he took office as Chinese president in 2013. Based on these principles, China and Africa, combining their wisdom and strengths, have forged a path for common development that is set to usher in stronger-than-ever ties between the Asian country and the African continent that have a combined population of over 2.5 billion, about a third of the world's population. Five years on, factual cases of mutually beneficial China-Africa cooperation and friendship abound. A most recent and notable example is in the southern African nation Mozambique, where a 187 km sea-bridge-crossing and link roads project built by a Chinese firm has become the new landmark decorating the skyline of the balmy coastal city Maputo, the capital of Mozambique. The project, costing 785.8 million U.S. dollars with 95 percent of the funding from China, is being built by the China Road and Bridge Corporation (CRBC) and is set for the official launch in June. It will enable easier transportation between the capital city and the outlying Katembe, and will also link Mozambique southward to South Africa, inevitably boosting trade and tourism. The bridge spans 680 meters over Maputo Bay. "I like working at the bridge project. Even though I am only part-time, the payment is satisfying," 24-year-old Francisco Alberto said. CRBC's project manager Cao Changwei said the firm has provided over 20,000 jobs, full-time and part-time, for the locals. As completion of the project draws near, the company is hiring an additional 3,800 locals for various jobs. The Chinese team stands at 467. In the eastern African nations of Ethiopia and Kenya, a few Chinese-built projects including the Ethiopia-Djibouti railway, the Addis Ababa light rail, and the Nairobi-Mombasa railway are further proof that China-Africa cooperation contributes to local growth, employment and regional integration. On the humanitarian issue, China is maintaining a peacekeeping corp with over 1,000 personnel in South Sudan where the civil war has entered the fifth year. China has also been providing rotational-medical-teams to the country since 2012. South Sudan's Acting Foreign Minister Martin Lumoro said earlier this month that Chinese doctors have contributed greatly to the country's health sector. "China is the only country helping us. Others (countries) are running away from South Sudan, but China is coming to help. We cannot forget this kind of assistance to the people of South Sudan," Lumoro said. In West Africa, where the Ebola outbreak wreaked havoc in 2014, China immediately sent medical workers and communicable disease experts to Guinea, Liberia and Sierra Leone to help the three nations overcome the crisis. Chinese firms based in Sierra Leone were also the first foreign rescue team to provide aid after rain-triggered mudslide killed over 1,000 people in its capital city Freetown in August 2017. Ndrianja Ratrimoarvony, a researcher on China-Africa relations based in Madagascar, told Xinhua that China gains "bonus points" when interacting with Africa because it never interferes in African countries' internal affairs and sticks to the principle of mutual respect, which leads to win-win outcomes for both sides. "That's why more African countries are beginning to give more emphasis to bilateral ties with China compared to relations with France or America," Ratrimoarvony said. The summit of the Forum on China-Africa Cooperation (FOCAC) held in December 2015 in South Africa's Johannesburg was a milestone for bilateral ties. It sent a strong message to the global community that China and Africa stand together and win together. The majority of the cooperation plans, announced during the summit covering industrialization, agriculture, infrastructure, finance, trade facilitation, poverty reduction and public health, among others, have been achieved. Agricultural modernization, for instance, is a key cooperation plan between China and Mozambique. In an interview with Xinhua, Chinese Ambassador to Mozambique Su Jian said the Wanbao rice farm project based in Mozambique's Gaza province was an exemplary model for China-Africa cooperation. "The project will greatly help Mozambique address its rice shortfall of up to 600,000 tonnes annually," Su said, noting that local farmers are learning new farming skills and technologies from Chinese companies and have improved their lives. "This clearly shows how China's principles in its Africa policy are benefiting the ordinary population," Su said. The success of these cooperation initiatives also gained acclaim from independent institutions. A 2017 report from McKinsey & Company, a global business counselor, said China has become Africa's most important economic partner in two decades. "Across trade, investment, infrastructure financing, and aid, no other country has such depth and breadth of engagement in Africa," it said. It said Chinese firms are bringing capital investment, management know-how, and entrepreneurial energy to every corner of the continent, and in doing so they are helping to accelerate the progress of African economies. "In Madagascar and other parts of Africa, big Chinese technical firms like Huawei and ZTE have a strong presence," Ratrimoarvony said. "In many African towns and even villages, you can also see Chinese doing business. Their commercial activities have become a part of the socio-economic lives in Africa, and this is a strong sign of very strong China-Africa cooperation." "Bilateral relations will only grow stronger over time as Chinese and African leaders are continuously exploring new cooperation areas and strengthening mutual trust," he said. In September, a new FOCAC summit will be held in Beijing, where top policymakers from China and Africa are to firm-up key cooperation plans. China and African nations are expected to align their development strategies and coordinate policies under the Belt and Road Initiative, the UN's Sustainable Development Goals and the African Union's 2063 Agenda. "China and Africa are always a community of common destiny as they share deep-rooted friendship and the same pursuit of development and prosperity," China's top legislator Li Zhanshu has said, as he makes visit to three African nations, namely Ethiopia, Mozambique and Namibia from May 9 to 18. Li, chairman of the Standing Committee of the National People's Congress, said China is happy to see a united, peaceful and prosperous Africa and stands ready to further its comprehensive and practical cooperation with the continent, noting the hope for more fruitful results within the frameworks of the Belt and Road Initiative and the FOCAC. The top legislator also expressed the belief that China and Africa will work together to make the Beijing summit of the FOCAC in September a historic event to advance China-Africa cooperation. Currently, sub-Saharan Africa is witnessing a growth uptick with regional economy to recover to 3.4 percent this year from a 20-year low of 1.4 percent in 2016, according to the International Monetary Fund in its economic outlook report for the region. The report highlighted the Belt and Road Initiative for its impact on supporting private investment in Africa. It said countries including Kenya, Ethiopia, Mozambique, South Africa and Tanzania are seeking active involvement, and the coverage is likely to expand over time. The initiative could help sub-Saharan Africa better integrate into global value chains, it added. Stephen Ndegwa, public policy lecturer at the United States International University Africa based in Kenya, said eastern and southern Africa could be important bases for projects related to the initiative. He said that as China commits to further reform and opening-up, China's capital and technologies will closely interact with Africa's natural resources, demographic dividends and market potentials, thus creating new growth for both sides.